When the nose’s nostrils (left and right) are not equally separated due to a crooked or deviated nasal septum, then that condition is referred to deviated septum or nasal septum deviation. 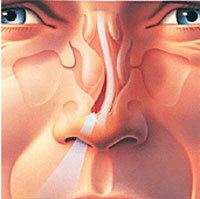 Normally, the nasal septum is located centrally and divides both right and left nostrils equally. Usually, deviated septum does not produce and symptoms, however, when the case of deviated septum is already severe, which can have effects on a person’s breathing, that will be the time that a person with a deviated septum can feel symptoms already. Severe cases of deviated septum can be an underlying cause to other medical conditions, including ear infections. Usually, people who are suffering from deviated septum have problems with proper drainage of nasal discharges of mucous. Deviated septum can cause accumulation of nasal mucous in the nose, which can possibly reach the inner ear. Blockage and accumulation of nasal mucous in the nose and inner ear can increase the risk of the development of sinus infection and also ear infections. The most effective treatment method for deviated septum is through deviated septum surgery or septoplasty. Septoplasty is a surgical treatment that involves surgically correcting the deviation of the cartilage inside the nose to make it straight. And sometimes, if the crooked cartilage can’t be corrected, it will be totally removed and be replaced with an implant. 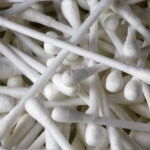 For the treatment of ear infections, it can easily be treated with prescribed antibiotics and rest. Aside from ear infections, deviated septum can cause several complications. 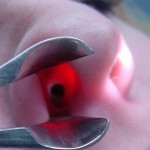 Chronic or recurrent sinus infection is one of the most common complications of deviated septum, wherein the body can develop resistance to antibiotics. In situations like these, septoplasty or deviated septum surgery may be considered. At the first sign of nasal congestion, the patient may be recommended or prescribed to take decongestants. Decongestants can help in draining nasal mucous, which can prevent nasal infections and ear infections associated with deviated septum.